The death toll in Fiji has jumped to 42 amid fears for remote areas and islands yet to be reached by relief teams, days after a devastating cyclone. Cyclone Winston, thought to be one of the strongest storms to hit the Southern Hemisphere, left 8,500 sheltering in evacuation centres. Teams are still being deployed. Officials said they met "grim images of devastation" on reaching Koro island. The Red Cross has warned that the toll could still rise further. The powerful cyclone, which struck last weekend, brought winds of over 320km/h (200mph), torrential rain and waves of up to 12m (40ft), flattening many buildings in parts of the main Viti Levu island and Koro islands, Fijian officials said. Fijian government spokesman Dan Gavidi tweeted on Wednesday that 42 people have been confirmed dead and rescue teams are continuing to be deployed across Fiji to reach affected areas. 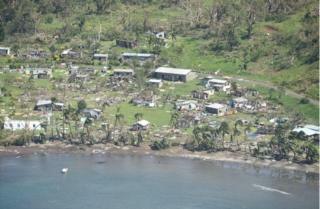 Communication with many smaller and remote islands in the Pacific nation of 900,000 people have been down since the cyclone hit. The acting head of the Red Cross's Pacific office Ahmad Sami told AFP news agency that the death toll numbers "will continue to change as we have better access to information and establish communications". Officials are also warning of the threat of dengue and zika spreading, as both viruses are carried by mosquitoes which can breed in stagnant water left by the storm. The government has also advised families to bury or cremate the dead as soon as possible because of a lack of facilities for storing bodies. Power is gradually being restored in the main centres but mortuaries are still without electricity. Foreign aid is pouring in from Australia, New Zealand, India and the European Union, and aid agencies. New Zealand has sent several planes and helicopters including military aircraft, and specialised medical evacuation teams. Though the devastation has been described as "catastrophic", officials have also said the destruction could have been far worse had the storm not changed direction at the last minute, sparing the capital Suva its full impact.